Some industrious fellow has imported real live Water Buffalos and is making proper Irish Buffalo mozzarella in Macroom. Well done him! This stuff is truly delicious and deserves to be the star of the show so we suggest serving it generously with some complementary bits (instead of putting it on a pizza!). Here’s what we tried first and we’ll defo be back for more. If you’re in Dublin you can pick some up in Fallon & Byrne on Exchequer Street or at any Real Olive Company stall at your local market. Cook the beetroot in boiling water for about an hour or until tender (the cooking time will vary slightly with different beetroot sizes so best to cook them earlier in the day and leave to cool). Peel and cut into chunky slices. Slice the tomatoes into chunky slices too. Make a dressing with the vinegar and olive oil and pour into a bowl. Add the beetroot, tomatoes and capers, season well and toss gently. 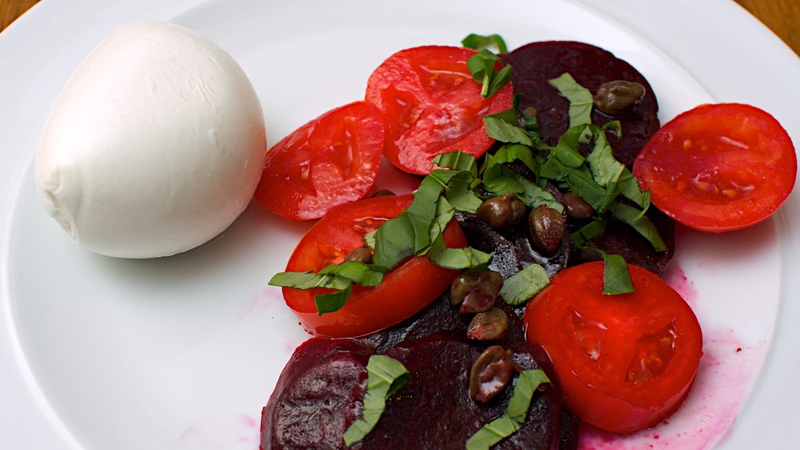 Serve the salad with the mozzarella and scatter over the basil leaves. Drink with: a northern Italian red. Try Dolcetto for freshness, Barbera for a bit of earthiness or Teroldego for freshness and gentle pepper spices. Nice combo … looks pretty too!